Periodontists Dr. Richard Amato and Dr. Michael Kang of Advanced Periodontics and Dental Implant Center of Connecticut, treat peri-implantitis in Newtown, CT, with LAPIP™, a minimally invasive solution to failing dental implants. LAPIP relies on special, laser-based equipment and protocols to remove infected tissues and resolve infections at the source. The Advanced Periodontics and Dental Implant Center of Connecticut periodontal team of Drs. Richard Amato and Michael Kang, are helping some patients with dental implants complications save their implants and improve their oral health. Although the dental implant success rate is very high when implants are placed by credentialed periodontists, the implant site and surrounding gums can become infected due to several factors. This condition is known as peri-implantitis. Peri-implantitis presents itself in a number of ways, including swollen gums, bleeding gums, discharge coming from around the implant, an unpleasant smell coming from the site of the implant and loosening of the dental implant. When Drs. 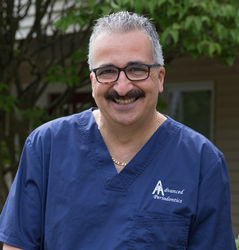 Amato and Kang diagnose a patient in Newtown, CT, with peri-implantitis, they regularly recommend LAPIP™, a minimally invasive laser dentistry treatment solution. In clinical trials, the LAPIP protocol has had a one-year success rate of 95 percent, meaning 95 out of 100 failing dental implants were stabilized and saved as a result of treatment. LAPIP relies on special laser-based equipment and protocols to remove infected tissues and resolve infections at the source. At Advanced Periodontics and Dental Implant Center of Connecticut, the periodontists utilize the trusted PerioLase®MVP-7™ laser. The ultimate goal of LAPIP is to comfortably sanitize and heal the dental implants site to prevent further damage and restore complete oral health. Patients residing or working in Monroe, Trumbull, Shelton, Danbury, Newtown or Waterbury, CT, with suspected peri-implantitis are urged to call Dr. Amato’s and Kang’s practice at 203-268-2000 to schedule an appointment.